I was born in 1984 on December 27. 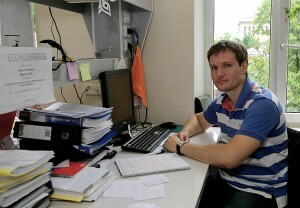 In 2002 went in the Russian State Medical University at the Faculty of medical-biology, department of Biochemistry. In 2008, graduated from the University received a degree in medical biochemistry from the award of the qualification of Medical Biochemists. In 2008 entered graduate school of Research Institute of Physical-Chemical Medicine. Since 2006 I have been working in laboratory of Molecular microbial genetics. In 2008, registered to bid a scientist. Advances in molecular biology and genetics. The study of molecular genetic mechanisms of microbial resistance, genetic aspects of evolutionary processes, molecular identification and typing of pathogens. Studies in the functional and comparative genomics. 1. A MALDI TOF MS-based minisequencing method for rapid detection of TEM-type extended-spectrum beta-lactamases in clinical strains of Enterobacteriaceae. Ikryannikova LN, Shitikov EA, Zhivankova DG, Il'ina EN, Edelstein MV, Govorun VM. J Microbiol Methods. 2008 Dec;75(3):385-91. Epub 2008 Jul 16. 2. Molecular surveillance of clinical Neisseria gonorrhoeae isolates in Russia. Ilina EN, Oparina NY, Shitikov EA, Borovskaya AD, Govorun VM. J Clin Microbiol. 2010 Oct;48(10):3681-9. Epub 2010 Jul 21. 3. Comparative evaluation of new typing schemes for urogenital Chlamydia trachomatis isolates. Ikryannikova LN, Shkarupeta MM, Shitikov EA, Il'ina EN, Govorun VM. FEMS Immunol Med Microbiol. 2010 Jul 1;59(2):188-96. Epub 2010 Apr 7. 4. Mass spectrometry based methods for the discrimination and typing of mycobacteria. Shitikov E, Ilina E, Chernousova L, Borovskaya A, Rukin I, Afanas'ev M, Smirnova T, Vorobyeva A, Larionova E, Andreevskaya S, Kostrzewa M, Govorun V. Infect Genet Evol. 2012 Jun;12(4):838-45. Epub 2011 Dec 30. 3. Genome sequencing of XDR M. tuberculosis strain endemic for Russian Federation. E. Shitikov , E. Ilina, L. Ikryannikova, D. Ischenko, T. Parfenova, M. Malakhova, I. Rukin, L. Chernousova, E. Larionova, V. Govorun. 5th European Conference on Prokaryotic and Fungal Genomics, 18-21 September, 2011, Germany.